The slur of "racism" has been hurled at Muslims who support Quebec's Bill 62 — the new law banning face coverings, for example the burka and niqab, when giving or receiving government services. From Ontario Liberal Premier Kathleen Wynne to Ontario Progressive Conservative Leader Patrick Brown, many white politicians and liberal media commentators have been quick to label any support of Bill 62 racist. Since I, a Muslim, support Bill 62, I guess that makes me a racist. Indeed, it's not uncommon to hear whispers suggesting Muslims like me who support the burka and niqab ban are "sell-outs" within the Muslim community. And that white politicians who oppose Bill 62 are trying to salvage the reputation of our community, despite our supposed betrayal. 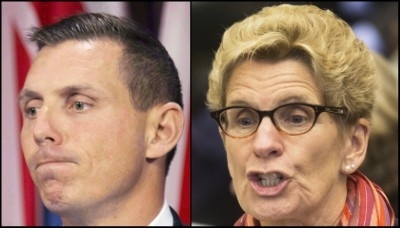 Ontario Liberal Premier Kathleen Wynne and Ontario Progressive Conservative Leader Patrick Brown are fierce political rivals, but both have been quick to label any support of Bill 62 racist. After all, what do these politicians have to lose? The political race to the bottom to curry favour with the so-called "Muslim vote bank" in Canada, as they see it, has worked well for both Conservatives and Liberals, charmed as they are by many second-generation radical Muslims who were born in Canada, some of whom hate Western civilization more than their parents do. But none of the attacks on Quebec's burka/niqab ban were more disingenuous than one told by a well-coiffed hijabi on Canadian television recently, dismissing the public safety aspect of people wearing facemasks. There is a political race to the bottom to curry favour with the so-called 'Muslim vote bank' in Canada. This young Muslim woman claimed there has not been a single incident where someone wearing a burka committed a crime. Two months ago, on Aug. 17, 2017, an armed robbery took place at a Scotia Bank branch in Milton, Ontario. Police said one of the two suspects was wearing a balaclava. On Sept. 9, 2015, two burka-wearing male teens charged into a Toronto bank in the Yonge Street and Highway 401 area. Both were later arrested in Ajax. On Oct. 14, 2014, two men wearing burkas robbed a Toronto jewelery store in the York Mills and Leslie Street area, and walked away with $500,000 worth of gold and precious stones. On Aug. 18, 2010 an armed robbery by two masked men took place at a Scotiabank branch in Vaughan, north of Toronto. Ottawa police have in the past cited a handful of robberies in that city involving male suspects using Muslim women's religious garments as disguises. 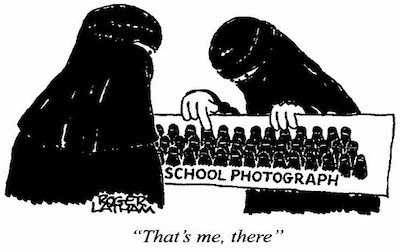 Some of us will never forget how a young Toronto Muslim woman, Bano Shahdady, threw off her burka as she was divorcing her husband, only to be stalked by him disguised in a burka. He entered her apartment building and killed her in July 2011. 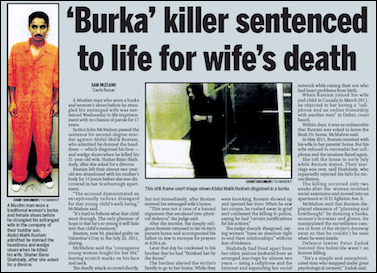 It was a story few media were willing to delve into, but because I knew the family, one journalist did report about this burka-related murder that almost went unreported. Around the world, numerous criminals have fled arrest wearing burkas, everywhere from London's Heathrow airport to the infamous Lal Masjid armed revolt by jihadis in Islamabad. My plea to vote-grabbing Canadian politicians of all political stripes in English-speaking Canada is, for once, be honest. Put the racist card aside and recognize burkas and niqabs pose a serious public safety risk.